Patricia Klindienst crossed the country to write this book, inspired by a torn and faded photograph that shed new light on the story of her Italian immigrant family’s struggle to adapt to America. She gathered the stories of urban, suburban, and rural gardens created by people rarely presented in books about American gardens: Native Americans, immigrants from across Asia and Europe, and ethnic peoples who were here long before our national boundaries were drawn—including Hispanics of the Southwest, whose ancestors followed the Conquistadors into the Rio Grande Valley, and Gullah gardeners of the Sea Islands off the coast of South Carolina, descendants of African slaves. As we lose our connection to the soil, we no longer understand the relationship between food and a sense of belonging to a place and a people. 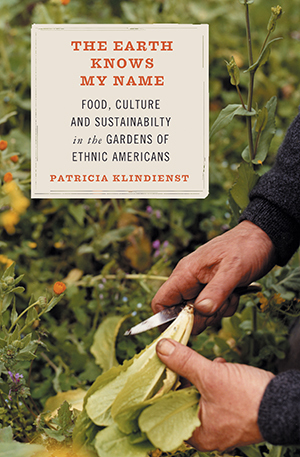 In The Earth Knows My Name, Klindienst offers a lyrical exploration of how the making of gardens and the growing of food help ethnic and immigrant Americans maintain and transmit their cultural heritage while they put roots down in American soil. Through their work on the land, these gardeners revive cultures in danger of being lost. Through the vegetables, fruits, and flowers they produce, they share their culture with their larger communities. And in their reverent use of natural resources they keep alive a relationship to the land all but lost to mainstream American culture. With eloquence and passion, blending oral history and vivid description, Klindienst has created a book that offers a fresh and original way to understand food, gardening, and ethnic culture in America. In this book, each garden becomes an island of hope and offers us a model, on a sustainable scale, of a truly restorative ecology. ". . .That gardening can connect us deeply to our cultural roots and form a foundation for a joyful existence regardless of our physical location has perhaps never been articulated as well as Patricia Klindienst manages to do in The Earth Knows My Name . . . This is a book you will want to savor as you would a long, slow meal with friends, absorbing and reflecting on each flavor and experience while garnering a greater understanding of the cultural forces which shape our food future."